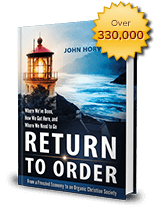 On April 28-29, Return to Order author John Horvat II delivered two talks at the Marian Conference held at St. Mary’s Cathedral School in Cape Girardeau, Missouri. Some 250 people were present at the event which was officially opened by Bishop Edward Rice. The topics of the two talks were “Getting Past the Rhetoric” and “Return to Order.” Mr. Horvat spoke about the four ways America can return to God and what Catholics can do to make it happen. He also addressed ways in which Catholics can better follow the Fourth Commandment of honoring thy father and thy Mother. Mr. Horvat drew from ideas found in the book, Return to Order: From a Frenzied Economy to an Organic Christian Society—Where We’ve Been, How We Go Here, and Where We Need to Go. 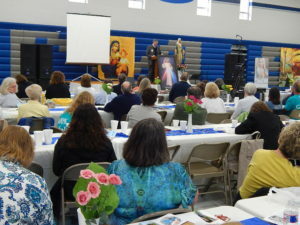 Also speaking at the event were Dr. GregoryMary Thompson, Deacon Patrick O’Toole, Fr. Chris Alar, and Michael Kiser. Confessions and devotions were also part of the program. Many vendors were present offering materials, statues and books in honor of the Blessed Mother. Need a speaker for your function, conference or classroom? See about having John Horvat speak by contacting him directly at jh1908@aol.com. This entry was posted in Featured and tagged Christian civilization, Christian principles, Family, frenetic intemperance, moral values, Return to Order by RTO.org. Bookmark the permalink.